How was your weekend? I spent mine in beautiful Tucson. It is hot as hell during the day, but the nights are FAN tastic. Moreover, the landscape there is a modernist’s dream. And how cheap!! 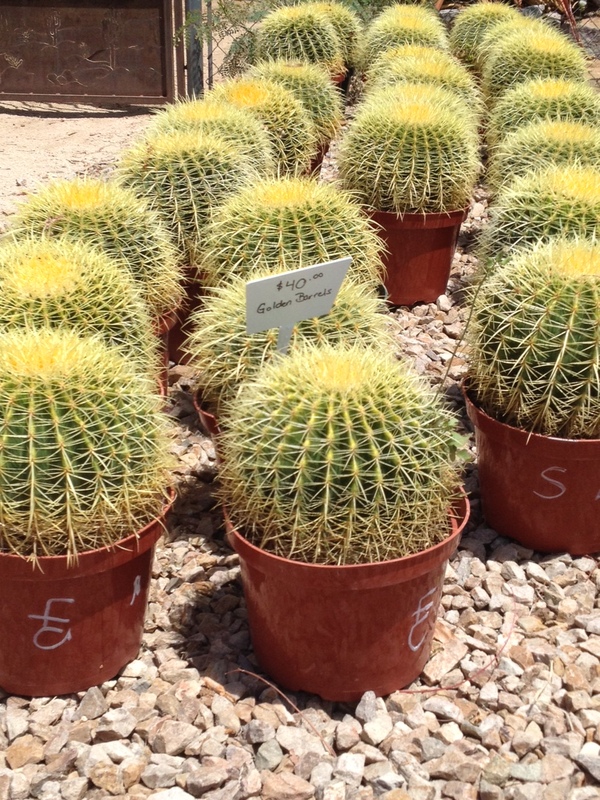 For this golden barrel cactus that will cost me $125 in Austin, it is $40 in Tucson. I almost committed myself to renting a Uhaul and driving a truck full of cacti home. It’s only 14 hours, right? Well, as promised, I am here to give you some info on how to create your own penny bar. First, get the bar cabinet base together. I decided to try to create a semi-custom look with wood cabinets from Home Depot. Step 1- Buy these cabinets from Home Depot. I think these are 15” wide. Step 2- Decide on your finish. I decided to use Erin Williamson’s awesome India Ink Method. Step 4- Sand the wood to get a smooth finish. 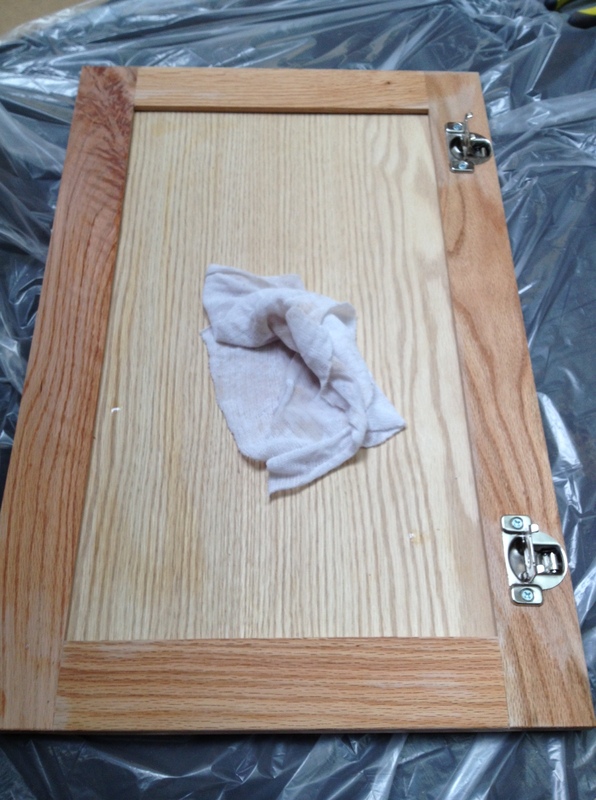 Step 5- Wet the wood to raise the grain to allow better penetration of the stain. Step 5- Brush on the India Ink. It dries quickly, so work quickly. 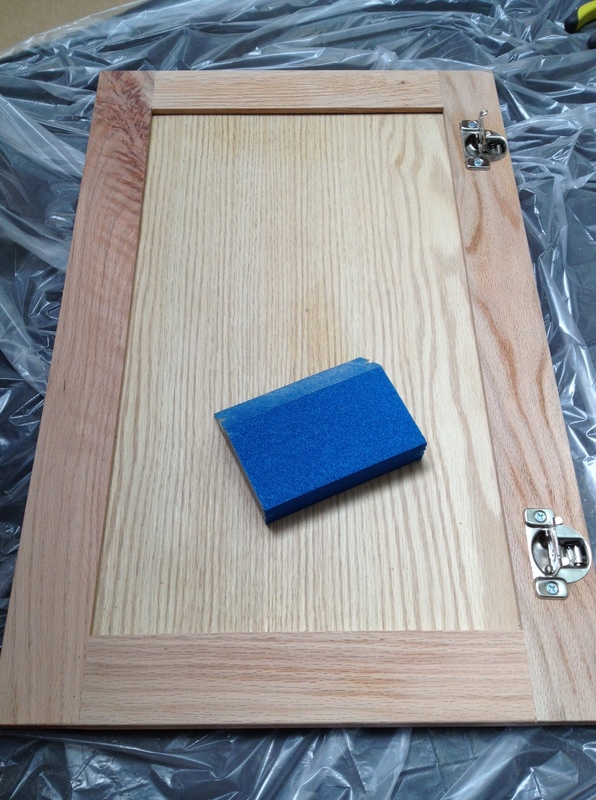 Step 6- Apply the Osmo polyx wax with a rag. Step 7- Pimp out toekick. I chose to apply wallpaper samples I already had to the toe kicks. I didn’t have to buy anything new, and it is a fun surprise to the eye where you least expect it. 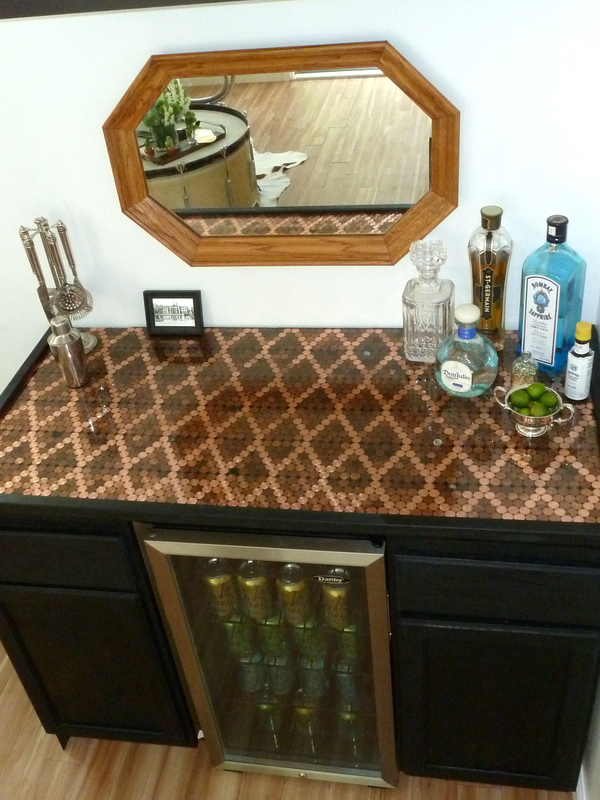 Now, time to focus our attention on the bar top itself. 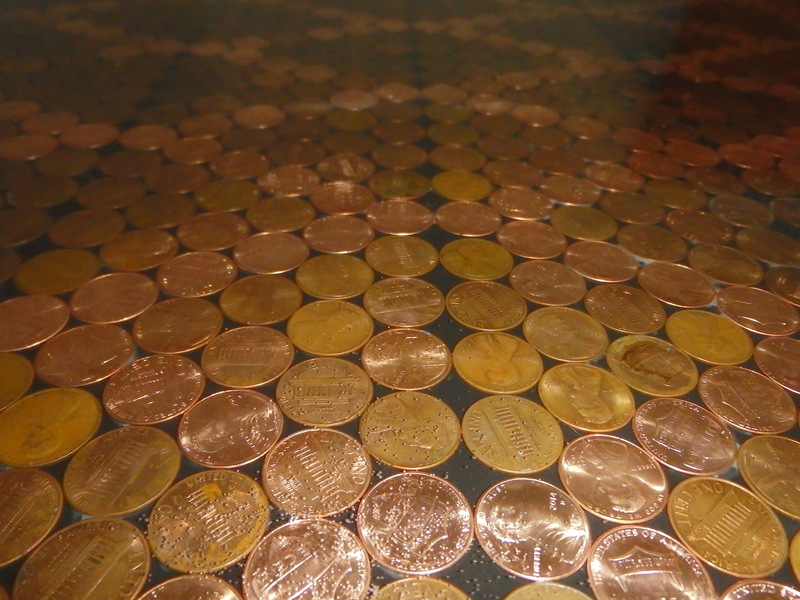 Step 1- Gather a LOT of pennies. 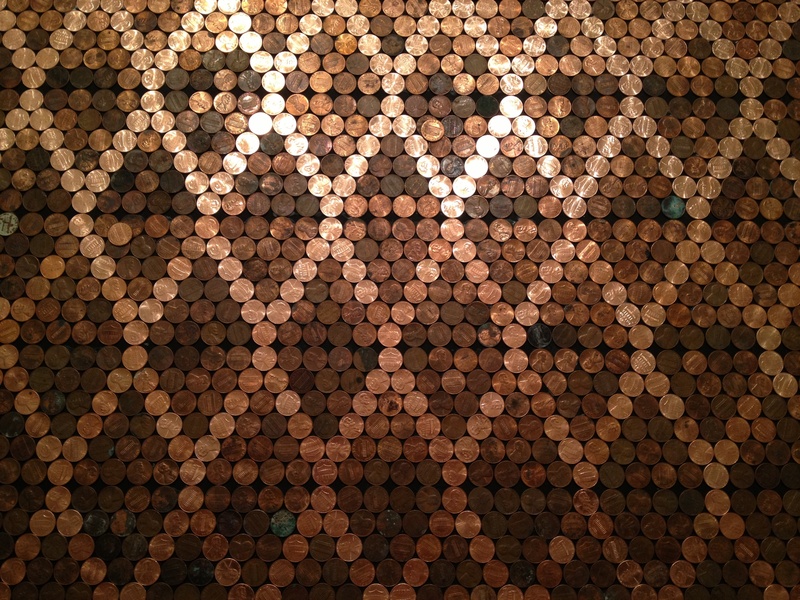 To create the pattern, I contrasted brand new shiny pennies, and dark, dirty pennies. 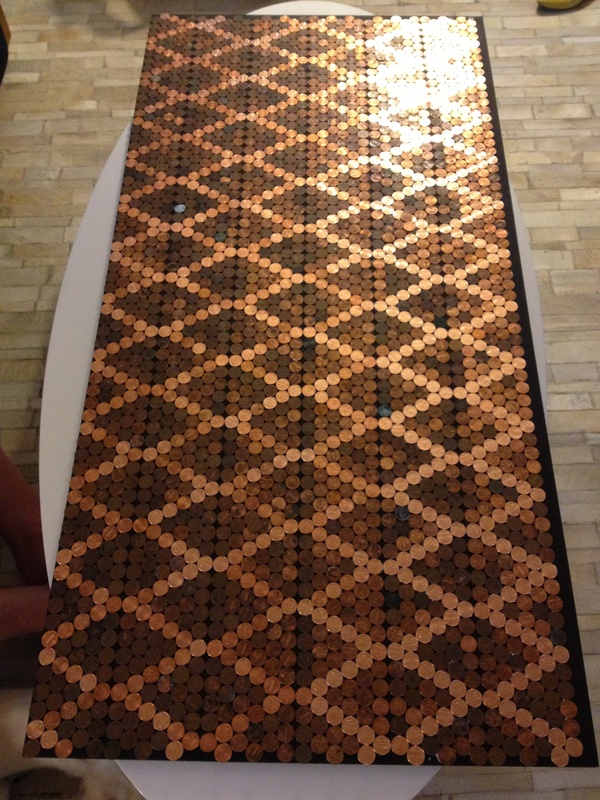 It is actually much harder to acquire the dark pennies. 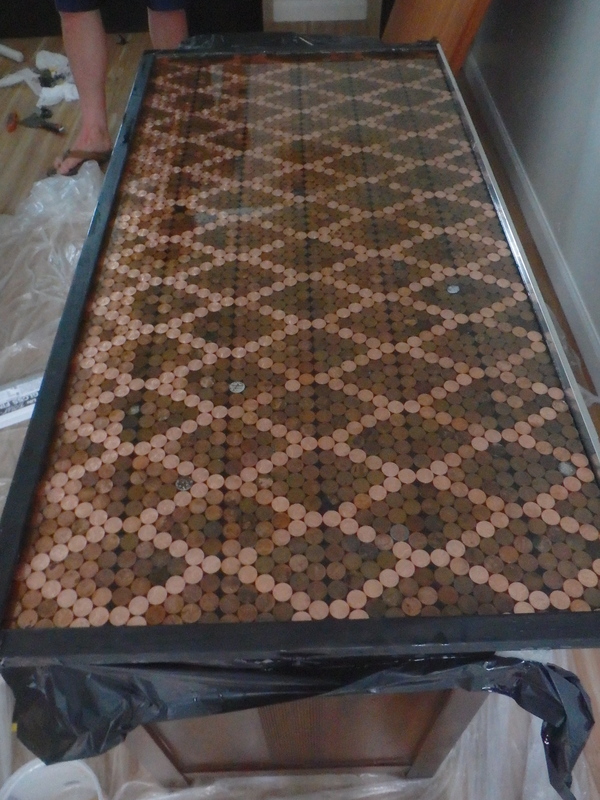 Step 2- Get a piece of wood or MDF and paint it a dark color, because it will pop through the pennies. 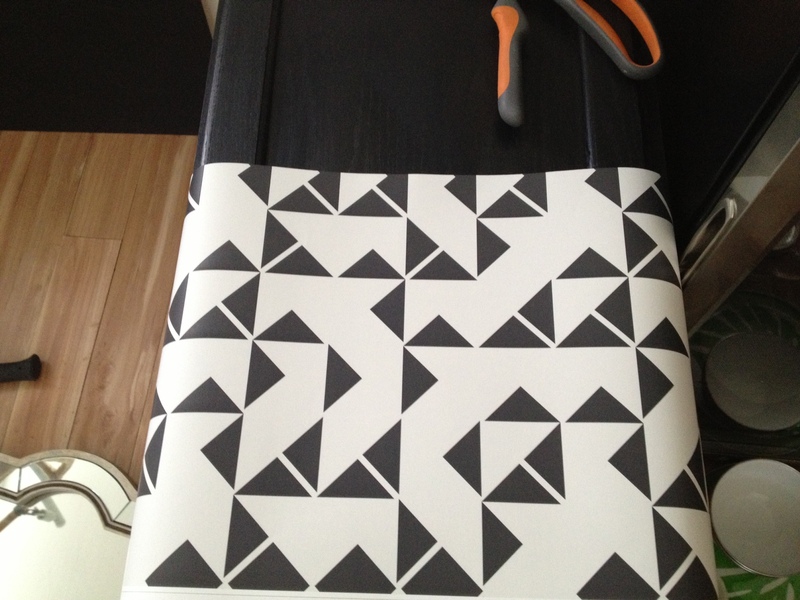 Step 3- Play around with a pattern. 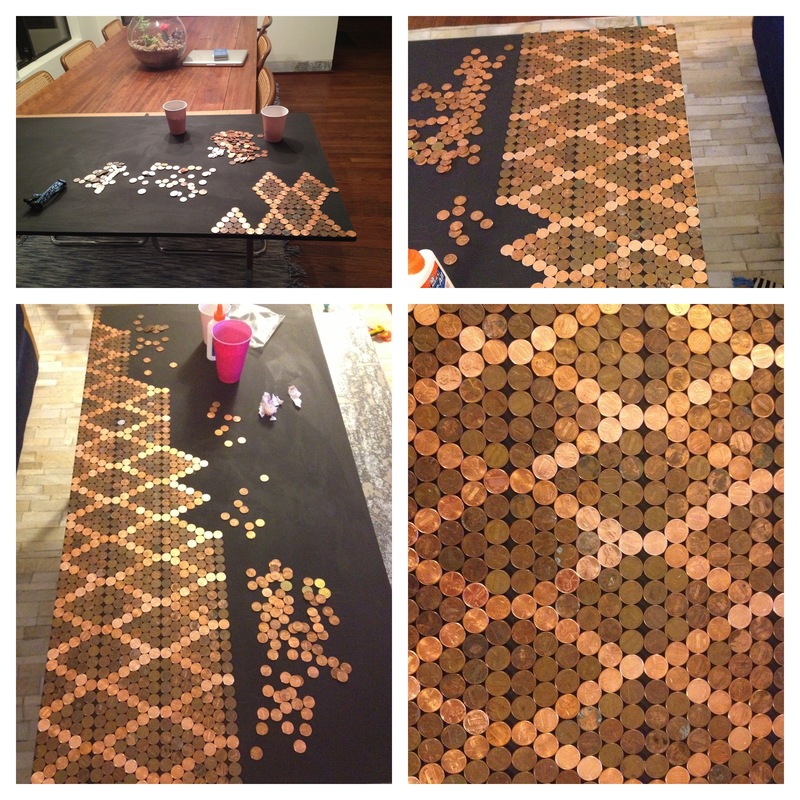 Step 4- Glue pennies on, one by one, with Elmer’s glue, drink in hand. 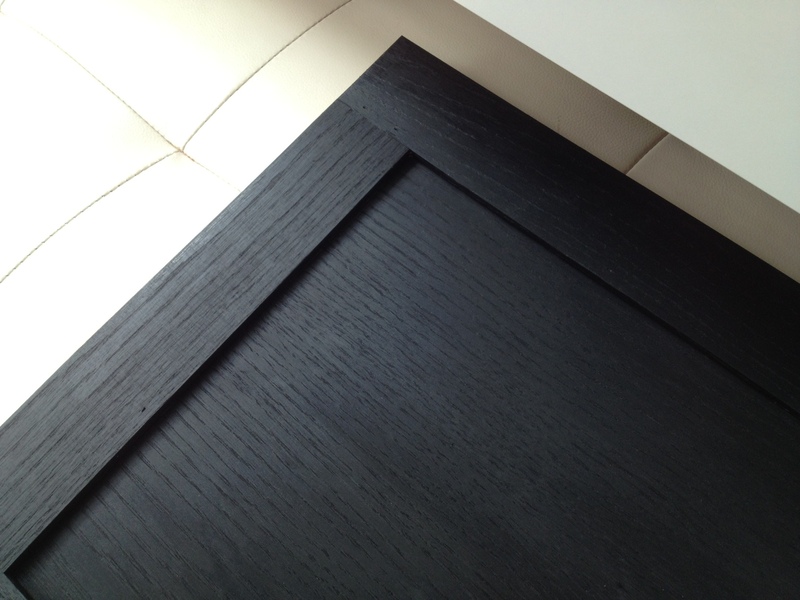 Step 5- Use a miter box and cut trim to fit around the edges to conceal those perhaps imperfect edges. Step 6- Glue trim on with Liquid Nails. 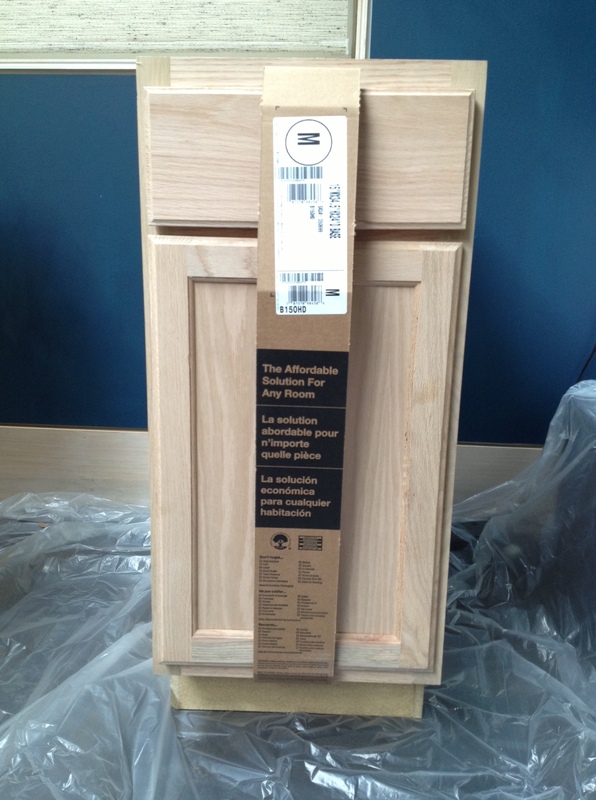 I chose not to put an edge at the back, as this would be flush against the wall. Step 7- Buy aluminum flashing at the hardware store and secure to back, and around sides if you please. I secured mine with duct tape. 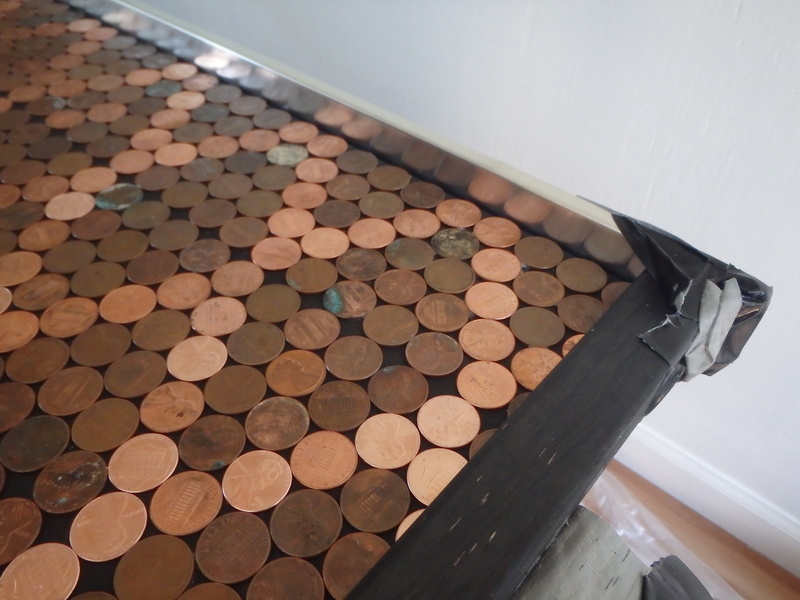 The purpose of the flashing is to act as a dam, keeping the epoxy in, and on top of the pennies, rather than running out the sides. 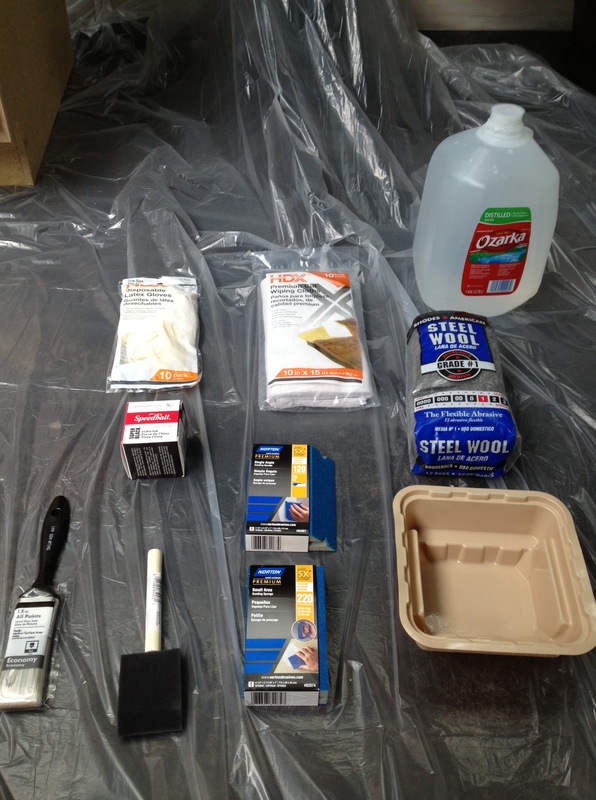 Step 8- Gather your supplies and mix the epoxy. You need a partner for the epoxy application. Follow the directions to the letter. 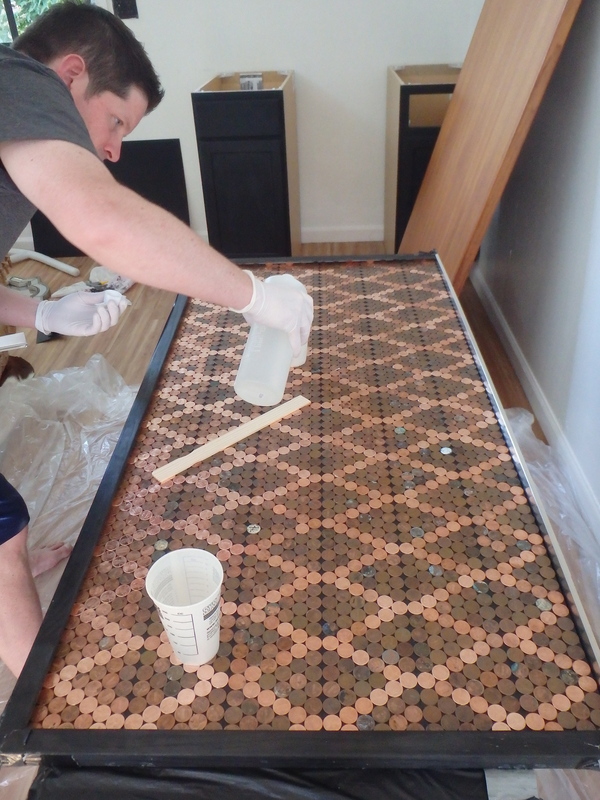 Step 9- One person pours the epoxy, the other spreads with either a putty knife or a paint stirrer. I used a stirrer. Step 10- Level out the epoxy, and don’t pick up your spreader too much, as this introduces air bubbles. Step 11- Use a butane torch to pop air bubbles. If you don’t have one (I didn’t), you can pop them, one by one, back- breakingly, with a toothpick. My husband is a saint BTW. Step 12- Let the epoxy cure. It takes at least 48h before you can put something on the surface. 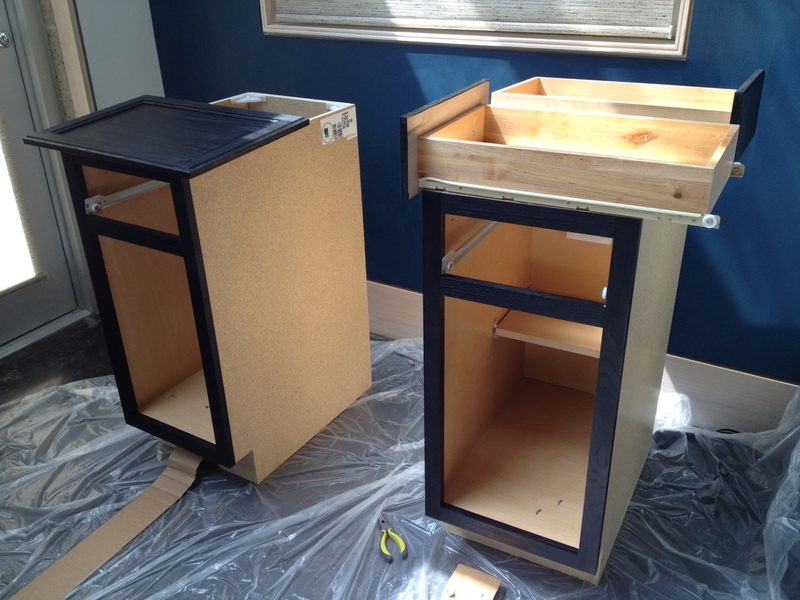 Step 13- Remove aluminum flashing, and attach the bar top to the cabinets. 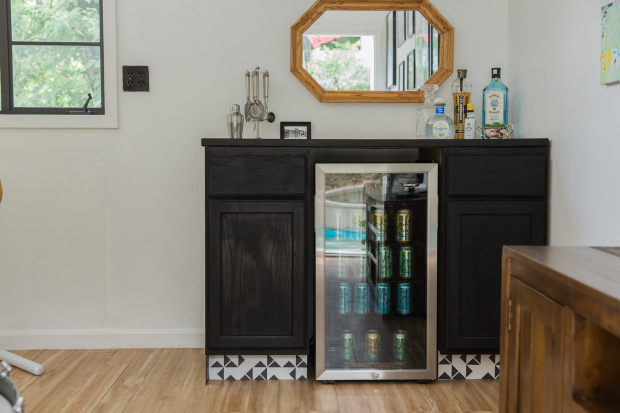 Step 14- Add a beverage fridge, style to your heart’s desire, and step back and admire. That cacti price disparity is so odd! 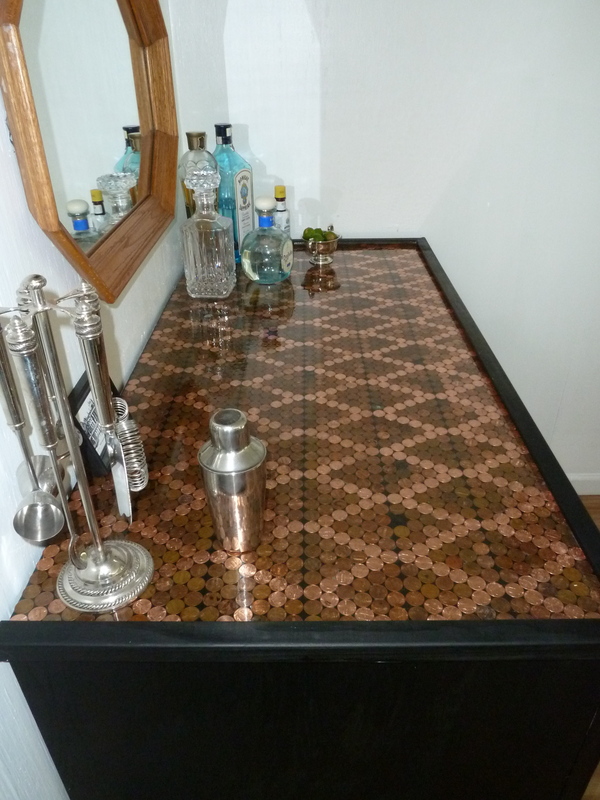 That bar top looks great- you have so much patience!! So gorgeous! One of my favorite pieces in the ORC! What a great project Celine. Looks like it took a lot of patience, but so worth it in the end! Dude… try Craigslist for Cacti… we’ve had a lot of luck landscaping our yards with Craigslist finds. Some growers sell from their own “private collection” of plants.